I still looking for ways to up the "welcomeness" of the front entrance to my home. 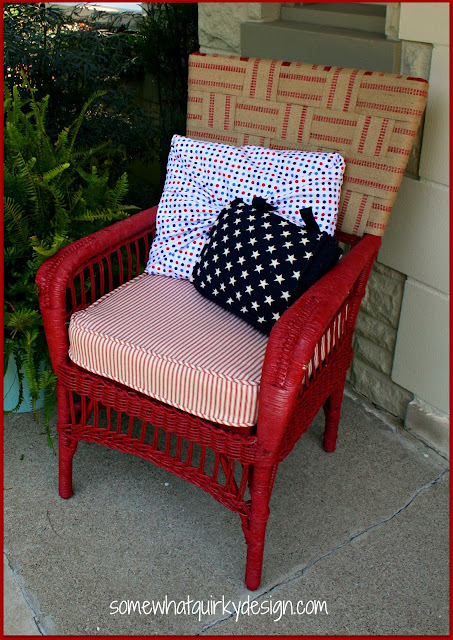 I thought a chair would be nice One that goes with my new flag. Perhaps I needed this chair to scare off our robbers.... It was bad. Probably not even worth the 10 bucks I paid for it. But then I painted it red. Wow! Then I covered the backless back with upholstery webbing. I just cut it to fit, tacked it on, and weaved it in and out. Done. So dang cute. Then I a seat cushion to fit and made a cover for it. 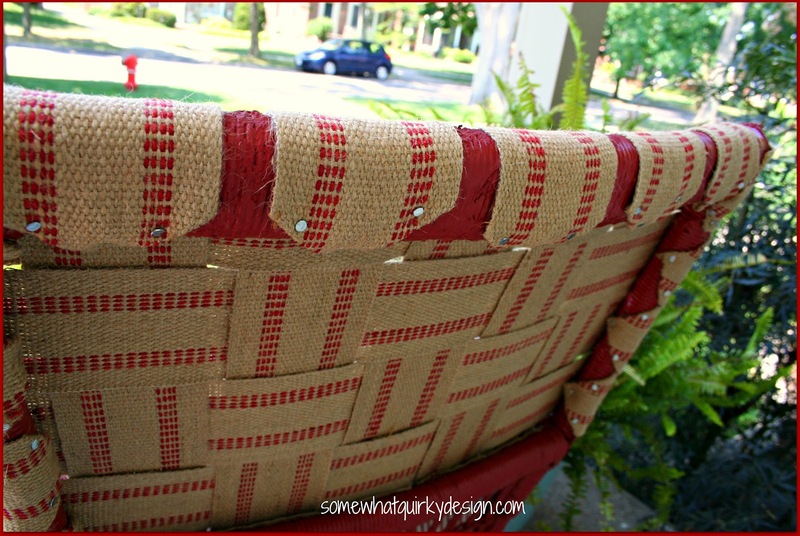 I started taking pictures to do a tutorial, but I made so many mistakes there are a lot of good tuts out there for seat covers so I thought I would enjoy my Sunday instead of doing a sewing tutorial. Sorry. I made it out of red/white ticking with a bulky matching welt. I also didn't really want to sew the pillows since they weren't going to be heavily used. So i just tied this one up. I laid the pillow diagonally across a yard of fabric, folded the top and bottom up, and pulled in the side flaps and tied them in a knot. Then I tucked the ends under the gathered fabric. I found this little tote at a garage sale on Friday and thought it would make a cute pillow. No sewing on this one either, I cut the straps to turn them into ties and stuffed a pillow into the bag as far as it would go. I cut a piece of a second fabric and tucked it over and around the exposed pillow. Finally, I tied the cut handles together. Looks enough like a pillow to me! Then I took the whole shebang out to the front porch and enjoyed it. I like it. I really like it. It's still a little rickety and has some complexion problems. But hey, so am/do I.
I can't believe it's the same chair! Amazing. I love the webbing. You are too good!!! I love it! 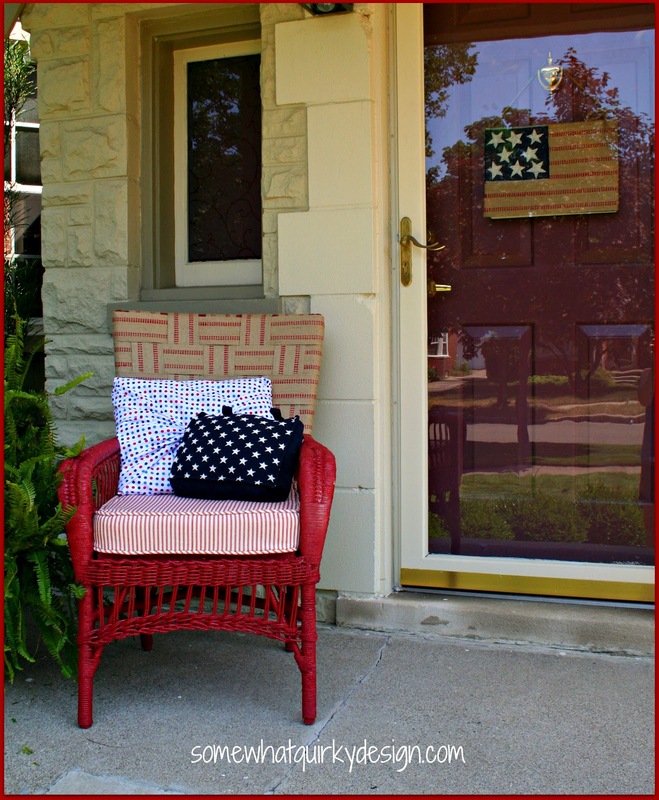 Red is my favorite and your front porch is divine! I love everything about this post/project. 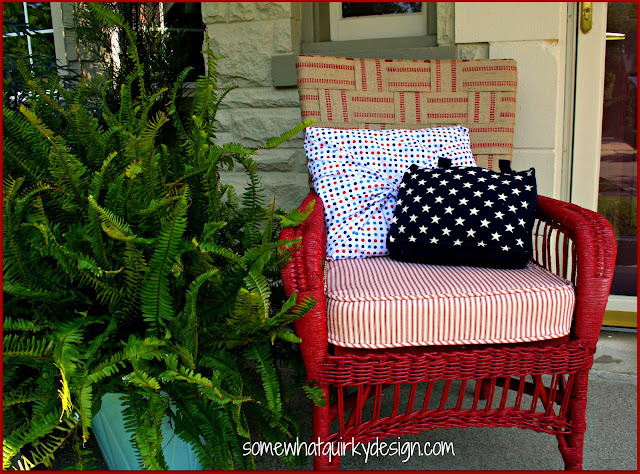 From the webbing, to the pillows (especially the no-sew) to the humor! Great job on all! So cute! It looks great! This is really, really, really, really super cute!! You can't even tell its the same chair! Another great project! That is crazy. Just crazy. What the heck? You can weave, and transform, and OMG! AMAZING!!! I can't believe that is the same chair. Love the pillows too. Wow! That chair looks completely different. I like it red! I love wicker, and can't believe how you tranformed her. Love the upholstery jute on the top, looks so good. Loving it red! Thanks also for letting me know how much you liked my two toned charmer buffet. Also loved learning how the feel were made, love learning history of things. So glad you like her! This is soooo cute. I am going to copy your webbing idea on a chair of mine that I am procrastinating on forever. I love your no sew pillows. Now, that's my kind of project. Wow. 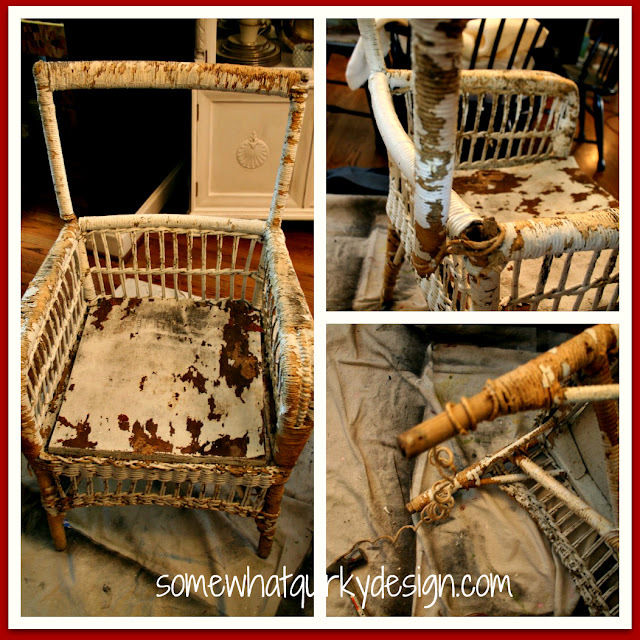 when I saw the "before" I really had to gasp! You did a great job making it pretty. You had me at RED. I can't believe the difference just by painting the chair red. Hi there my friend! I have visited before and was amazed at the transformation! Thank you so much for sharing this at Joe's first linky party! I am going to go pin this over on the new party board! hugs and thanks! Wow! It sure did turn out great! 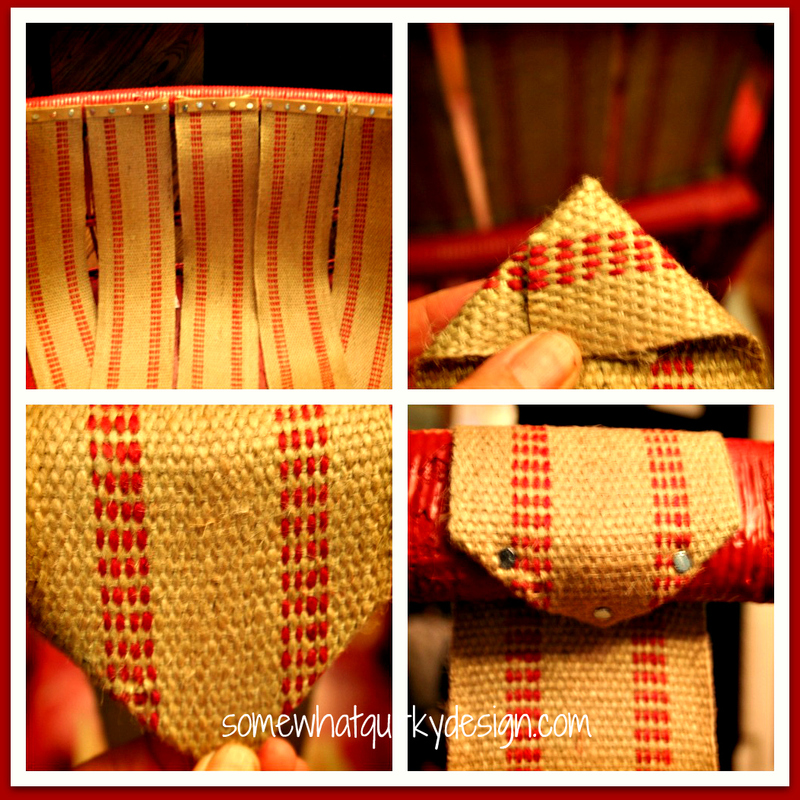 I love, love, love that woven back, what a great idea!! Hi, I'm Holly and i'm here via andrea's Junkin Joe's linky party! That is great looking! 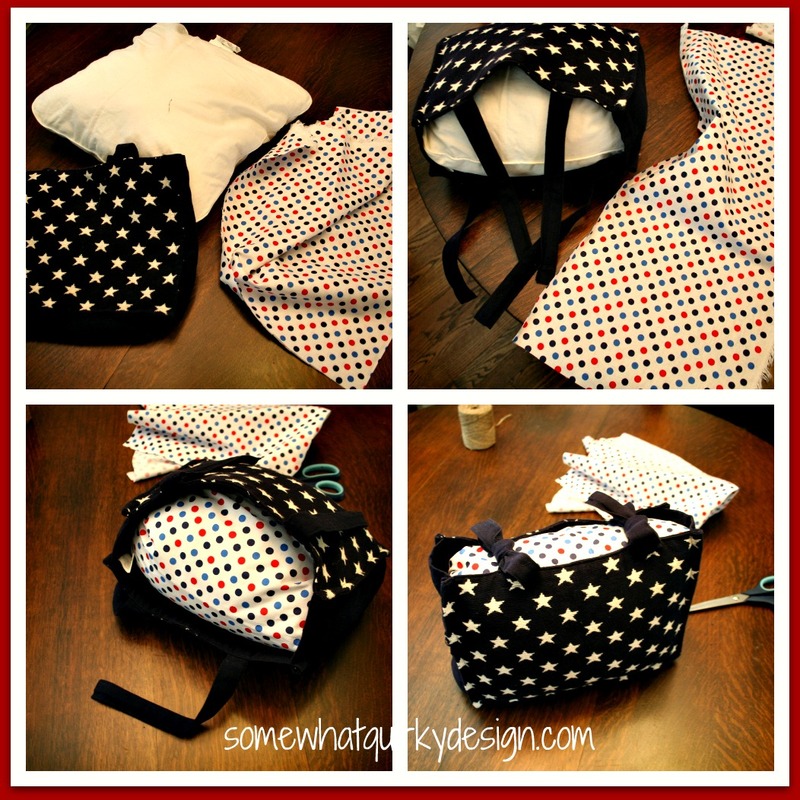 And I love all your no=sew tricks! Haven fun at the Junkin Joe Party! That's my kind of furniture save! I think I would have passed by that chair. Just fabulous. You are so clever! Your chair and pillows are adorable.